Geist! Page 21 – Geist! Flashbacks. I think those are the kind of thing Dr. Hamka would tell you to avoid, Kate. Hi everyone! 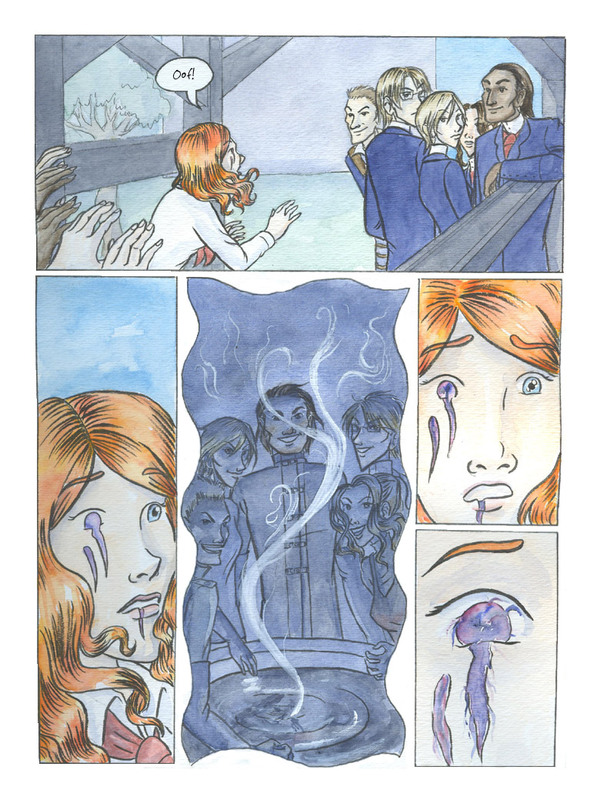 Thought I’d put out a comic rec for today: Amy Unbounded, by Rachel Hartman. It’s a print comic, and it’s kind of tricky to find, but so very worth the effort. Your local comic store may have a copy, or you might be able to find it at some of the big online bookstores. It’s hard for me to explain what’s so great about Amy Unbounded. The artwork’s not showy, the plot’s not epic or full of explosions; it’s the story of an imaginative girl growing up in a just-faintly magical, medieval world. But it’s funny and heartfelt, the characters are quirky, multi-faceted and thoroughly likeable, and the setting is rock-solid and believable in every detail despite the touches of fantasy and broad swathes of silliness. Or, if you want the catchy sell: Clock-making barbarians! Saints devoted to ducks! High Fashion! Cheese! I love this book. I can’t imagine that anyone wouldn’t.